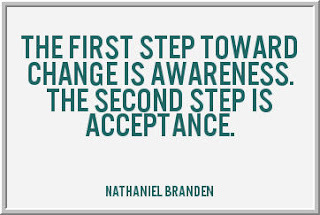 Two of the most powerful psychological assets in trading are awareness and acceptance. Let's look into those. Awareness means that we consciously direct attention to something. We become a keen observer; we focus our attention. Self-awareness means that we direct our attention inward and observe ourselves. Market awareness means that we step back from moment to moment price action and observe something about the market. We most effectively act on something if we sustain awareness of it. 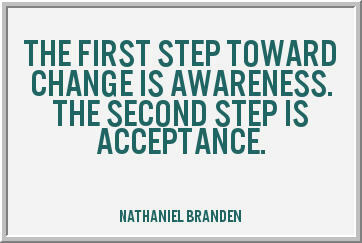 As Branden's quote suggests, however, awareness means little if it is not accompanied by acceptance. In a state of acceptance, we are open minded; we readily process what we observe. When we lack acceptance, our awareness cannot become insight. We shut off our awareness when we fight against it. Acceptance means that, sometimes, we have to process information that is uncomfortable. The trader who lacks awareness is clueless. The trader who is aware but who lacks acceptance is defensive. This is a very important principle. When we find ourselves becoming tense or frustrated in trading, it is often because we are aware of something we have difficulty accepting. Whatever that something is, is usually important. Yesterday I was trading long in the market early in the day and doing well. I then did my usual thing, waited for a qualified pullback and bought. The market ticked higher, stalled, and then went to a lower low on increased selling pressure and volume. My awareness said, "This shouldn't be happening." My acceptance said, "This is the wrong trade." I exited for a small loss. Then, however, a second level of acceptance kicked in. I said to myself, "A good trade that fails can be a signal in the opposite direction." In other words, if flows truly had shifted in the market, we should not look back and surpass the highs that preceded my qualified pullback. That acceptance of a change in market flows/direction allowed me to sell the next bounce and, indeed, continue to trade the short side in the afternoon. That made for a good day of trading, but it was only because I could truly accept the information the market was providing. Earlier in the week, I was locked into a view that we would move higher in the market and failed to accept the same exact information. That not only led to losing trades, but the failure to capitalize on potential winning ones. Interestingly, my lack of acceptance interfered with even my awareness. A closed mind cannot accept, but it also is hampered in processing what is in front of us. It is not enough to try to eliminate negative emotions in trading. Many of those emotions, from uneasiness and nervousness to frustration and discouragement, reflect an awareness that we are having trouble accepting. Losses and missed opportunities are less threatening when we view them as tools for expanding our awareness and gaining new perspectives. As in my case, the losing trade was the catalyst for winning--but only because of awareness and acceptance.